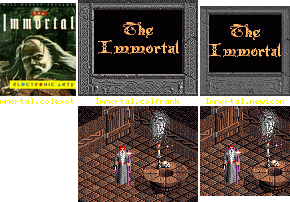 This install applies to "The Immortal" © 1990 Electronic Arts. The installed program requires 1.0 MB ChipMem and 1.5 MB OtherMem. - ability to set your password through CUSTOM tooltype, and recall it with TAB in the "enter certificate"
SPS version 340 is supported, version 3343 (NDOS) isn't.